The essay is about the use and abuse of Mesopotamian literature and archaeology by non-specialists. This tension and problem — “seeing” the material from Sumer, Akkad, Assyria, and Babylon as behind most everything in the Old Testament, especially the early chapters of Genesis — became known as “PanBabylonianism.” That arose in the 19th and early 20th centuries in the wake of the decipherment of cuneiform texts in the 19th century. It is the lifeblood of much of the “research” and “discovery” of self-anointed teachers (Christian or otherwise) one finds foisted upon unsuspecting readers on the internet and listeners on shows like Coast to Coast AM. their “findings” are hopelessly outdated and wrong in a myriad of ways as subsequent decades of scholarship has demonstrated. But no matter. It gets the paleobabblers on talk shows and gives them the attention they crave. 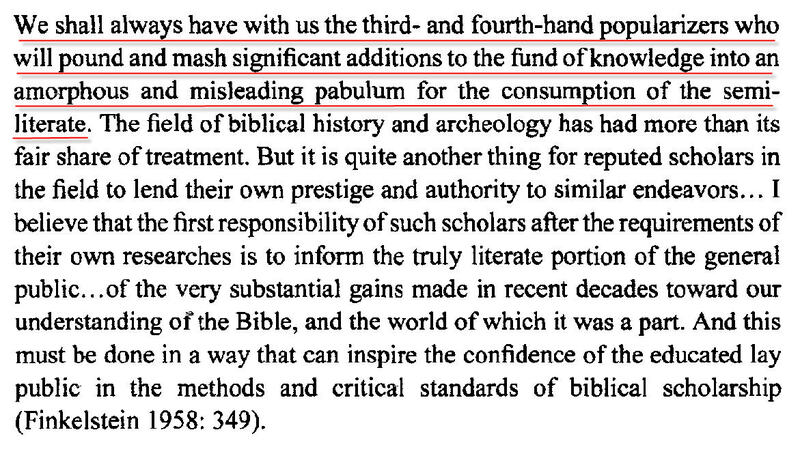 Chavalas ends his essay with this quote from Finkelstein (underlining is my own – it describes the paleobabble researchers well). It’s blunt but still encourages scholars to responsibly educate the public.